This section started off with the great job of deburring. 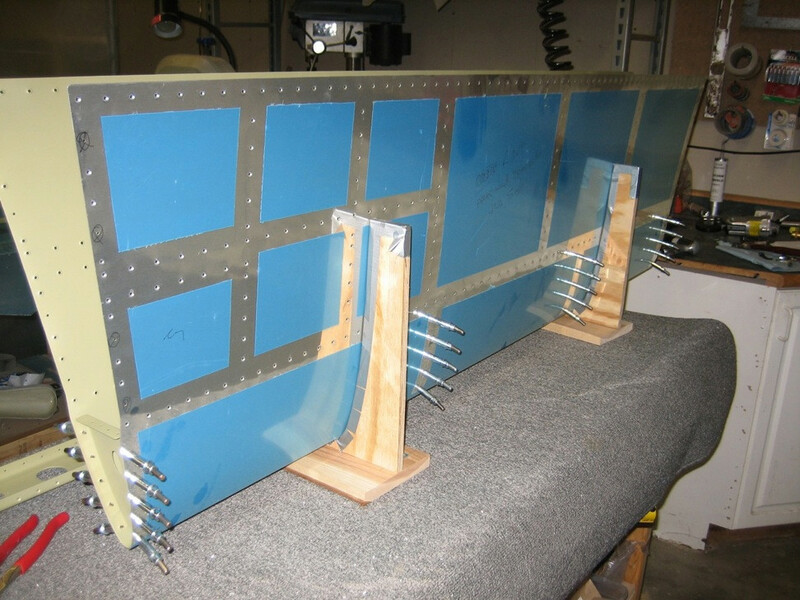 All the edges and lightning holes in the HS-1003 Rear Spar and the doubler plate. Match drilled all holes in double plate and rear spar. Countersunk the two middle holes in the doubler plate. On to clecoing the hinge brackets to the rear spar and match drilled the holes. I then disassembled all the pieces to apply alumiprep, alodine and Akzo primer. Once dried, riveted everything together. 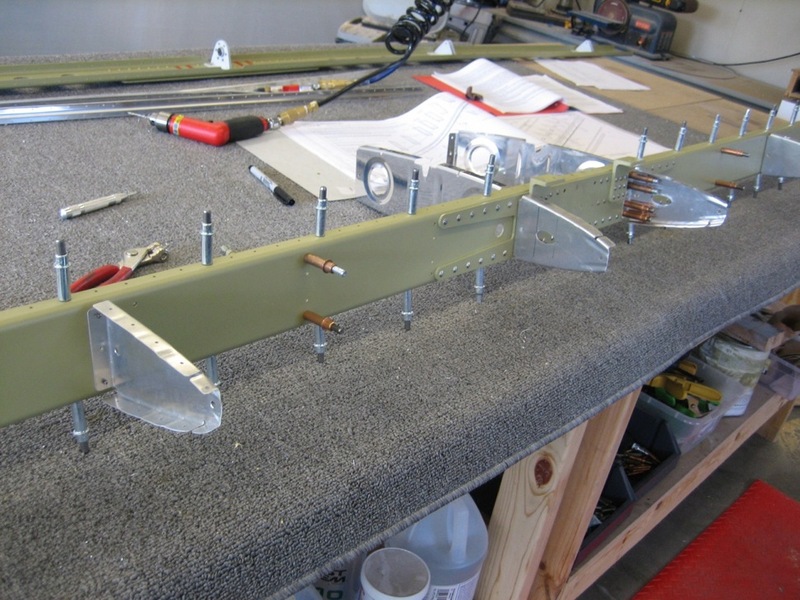 Next was to cleco the flange bearing between the two inboard hinge brackets, final drill the six holes, deburr, then reassemble with rivets, and the last step is to bolt it onto the rear spar assembly. The next step consists of making two brackets out of angle aluminum. This was a pretty simple to do process, but when cutting one of the brackets, I accidentally cut on the wrong side of the line. Stupid mistake. I will have to order a new piece of aluminum for Vans tomorrow. While waiting for the new angle piece to be shipped I went on to the next steps of cutting the spar caps and stringers. This consists of cutting the ends at an angle. Using a band saw works well to make the initial cut, then sand flat with a belt sander. Once these were cut, they needed to be deburred to remove any sharp edge. Used the scottbrite wheel for this. After deburring the edges and lightning holes for the front spar, you lay the spar caps in place, clamp and match drill the holes on the spar web. Make sure you do it on the web side and not the flange. Just about made this error. Once completed, you need to deburr all edges re-assemble and then match drill the holes in the flange. The next step involves attaching the brackets that were supposed to be previously made, but since I screwed up, skipped that step for now. I then clecoed the HS-1007 double plate to the front spar and match drilled all the holes. Since I screwed up one of the HS-1008 angle pieces, I finished them as the new piece of angle aluminum came in from Vans today. Once everything was deburred, I prepped and finished applying Akzo Primer. Once this was dry (the next day) it was time to start clecoing everything back together and riveted per instructions, and attached inboard hinge bracket assembly. Now to where I left off on the front spar. Everything on the HS-1007 has been deburred and match drilled and reassembled, I then attached the HS-1008 spar attachment brackets. Make sure you have them on the right side, the directions show them backwards as for left and right. it depends on what side of the stabilizer you have up. Also, there are some holes that should not be drilled out, make sure you place tape to keep them from being done. After countersinking the eight holes on the doubler and the nine on the spar flange, everything was taken apart, deburred, alumiprep, alodined, and the primed with Akzo. The last spar and parts have now dried so it is time to start riveting them together per directions. Once done you have to make some modifications to the HS-1004 Inspar ribs. Two have to be trimmed one way, and two a little more. Not hard just something that needs to be done. They are slots that hold the Long and Short Stringers. In addition to the trimming, the top and bottom of the Inspar ribs need to be bent to 9 degrees. I did this by clamping to the side of the bench, checked the angle and then used the hand seamer to bend to the 9 degree angle. This will also be done on two of the front nose ribs. When working with the nose ribs, make sure that you trim a bit of the front corners so that when installed they do not make the dimple in the skin. I did this and when installing, noticed that I did not do them enough. Luckily I did catch this in time and was able to get them trimmed farther without making permanent dents in the skin. Now that the piece are ready to be clecoed together, I made my cradles to hold the stabilizer skins vertical for assemble. These definitively do help as a another set of hands. The first part was to put everything together and match drill all the ribs to the front spar. They are then disassembled and the nose ribs get installed into the skins first. Then comes the spar, the HS-904 and HS-1004 ribs. Make sure to follow the instructions, read a couple of step ahead as these go in in a certain order. The rear spar was finally put in and clecoed together. The last step was to match drill all the holes, trying not to forget any. Starting tomorrow, I will take everything apart, deburr, dimple and prep for priming. Boy, seems like this thing goes together and then comes apart then back together many, many, many times. Exhausting!!! During some of the last steps, had a loss of memory and forgot to keep taking pictures. So that I accomplished was finishing up taking everything apart and prepped for and then primed. Now that everything is primed it was time to start the final assembly with riveting the two inboard ribs to the stringer webs and then rivet the HS-1014 and 1015 stringers together, then finish riveting those to the HS-1016 stringer web. The directions then call ask to install two snap bushings. Did this but added some E6000 adhesive to them so they would not pop out during construction. Once they fall out, would be very difficult to get back in. The next step you will definitely need a helper. This is riveting the front spar ribs to the inner skins. Got my friend Scott to help with this process. Without help, I you would need some very long arms and a lot of luck to get these rivets in, bucked and looking good. Then installed HS-1004 ribs in riveted to the font spar web and then slid that part of the assembly into the skins. I then riveted the front spar to the front ribs and the skins to the front spar. Then riveted up the inner ribs to the stringers and then along those stringers. These are not very fun rivets due to the lack of room. Once the stringers are riveted, you finish up riveting up the HS1004 and HS-904 ribs. Getting sick of all these rivets already. Need a break. 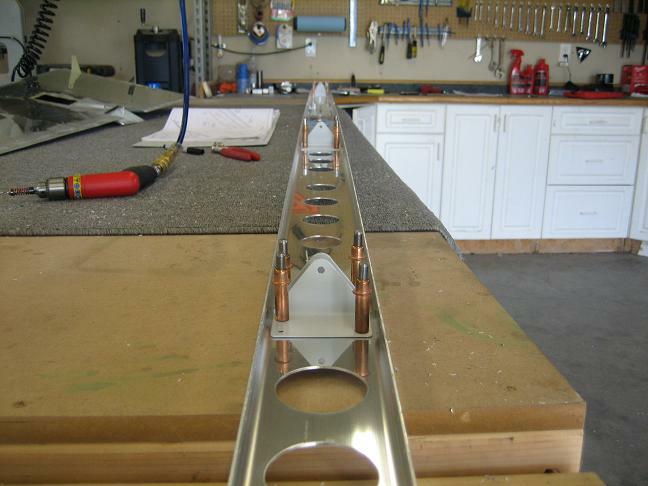 The last step is to rivet the rear spar in place. This was a pleasing experience since I did not have to buck the rivets but could use the pneumatic squeezer. Wow, that was a lot more work than expected. Oh well, Yeah!!! I am finished with this piece for now.